A. Vogel (Bioforce) atrosan Devil's Claw. A health supplement for arthritis,sciatica, gout, bursitis, fibromyalgia, sports injuries, lupus, hayfever, muscular pain. Is a licensed herbal rheumatism product. It is made from extracts of Devil’s Claw herb cultivated in the Kalahari without the use of artificial fertilisers, insecticides or fungicides. It can be used for joint pain and to reduce symptoms of back pain or other rheumatism pains in the shoulders and elbows, or for knee and other joint pains. Atrosan® Devil’s Claw tablets contain the extract of Harpagophytum procumbens root, also known as Devil’s Claw. One film-coated tablet contains 480 mg of extract (as dry extract) from Devil’s Claw root (Harpagophytum procumbens D.C. and/or H. zeyheri L. Decne.) (1.5-3.0:1). Extraction solvent: Ethanol 60% V/V. 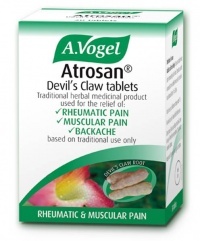 Other ingredients found in Atrosan® Devil’s Claw tablets are lactose, maize starch, microcrystalline cellulose, precipitated silica, colloidal silica and magnesium stearate (vegetable source). The tablet coating contains talc, titanium dioxide, macrogol and hypromellose. 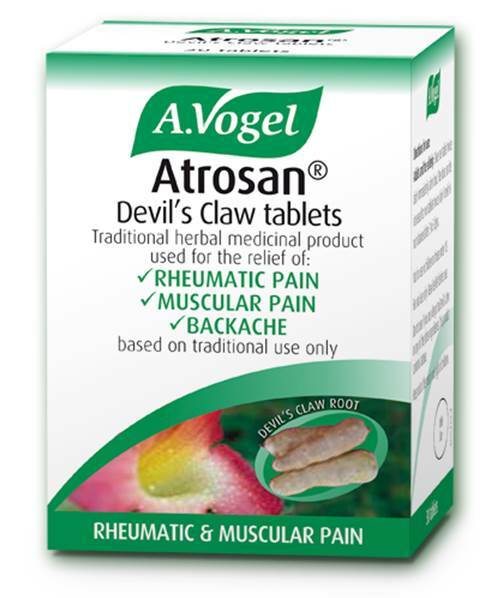 Atrosan® Devil’s Claw tablets may be used as a rheumatism product for the relief of joint & muscular pain in adults (over 18 years of age) and the elderly. Use one tablet twice daily immediately after food. The dose can be increased to two tablets twice daily if relief is not obtained after 3 to 5 days. Effective natural remedies and medicinal products made from freshly harvested plants. Healthy food products and dietary supplements made from organic raw materials. Reliable information on all issues relating to natural health – through emails, our web pages and books. A Vogel develop and produce remedies made from plant extracts (phyto-products) and herbal medicinal products made using fresh plants and distribute these internationally. They offer clear, reliable information on health issues. Natural, eco-friendly cultivation is at the heart of their business. They use fresh plants and take a particular interest in environmental issues. Customers respond to the quality of the products and appreciate being kept up-to-date with the latest information on health matters. They are totally committed to carrying on the work of Alfred Vogel and are delighted that they can do so. They agree with the objectives of their partners and encourage them to take responsibility. They are in favour of systematically maintaining and protecting health and encourage both personal and professional development. They act with honesty and integrity. Economic success guarantees their commercial independence, and our continuing development. The herbs used to produce A.Vogel fresh herb tinctures and fresh herb tincture tablets are grown using a strict organic protocol, mainly in the fertile conditions of Roggwil, Switzerland. This allows the company to exert complete control over the cultivation of plants - from the time of planting through to harvesting. All the company's products are manufactured under Good Manufacturing Practice (GMP) protocols and control. Stringent quality control tests and checks are carried out throughout all the stages of growth and manufacture. Seeds are collected each autumn to create the new stock of spring seedlings. These are planted out by hand in our organic fields where the Swiss climate is ideal for cultivating strong healthy plants.